Before she wrote Little Women and Little Men, Louisa, writing under the pseudonym A.M. Barnard, wrote this `blood and thunder' thriller. This was during the period when Louisa worked a nurse during the American Civil war. The rigid and unfair roles of men and women of this period, their expectations and desires, plays at large in this story of betrayed love, anger, petulance, and ultimately, vengeance. . . .softness vanished, the stern woman reappeared, and, crushing it in her hand with slow significance, she said low to herself, "This is an old, old story, but it shall have a new ending." "What jewels will the señora wear tonight?" "But the señora's toilette is not finished; the sandals, the gloves, the garland yet remain." "Leave them all; I shall not go down. I am tired of this endless folly. Give me that book and go." This is one of Louisa May Alcott's darkest works, again showing how talented she was at writing in different genres; a mark of a great author. This is a tale of a scorned woman's revenge on a man who informed her - via letter - that he'd dropped her to marry someone with more money. Just goes to show: when someone wrongs you, you'd better find a way to move ahead. Otherwise, if you trust to exact retribution, you may get bitten in the rear! Definitely not my favorite Alcott book. I couldn't stand to give her a two star rating, though. like a shorter count of monte cristo about pauline's revenge. patriarchy wins in the end though. The abrupt ending has me reeling. 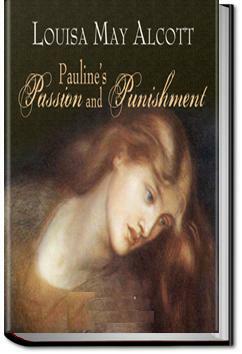 I found I did not like Pauline at all, and she certainly deserves punishment. A little disturbing, considering it's written by the author of Little Women...But a classic thriller with a horrifying ending...Fun to read!